This Eagle Biologist Journal will be updated approximately once a week with an overview of what has happened in the last week and what we expect in the next couple of weeks. The Eagle Web cam is presented by BioDiversity Research Institute and made possible through the generous support of FPL Energy Maine Hydro, Maine Department of Inland Fisheries and Wildlife, and US Fish and Wildlife Service. I am so happy to report that we have have been seeing frequent visits by eagles at this nest recently. These observations are a good sign that the birds are preparing to nest. 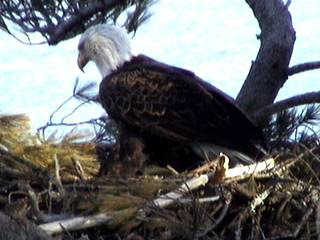 Yesterday, in fact, both eagles visited and continued to move sticks around and prepare the nest bowl. Earlier in the day we captured this photo of a single bird making some restorations to the nest. Please send along your questions and observations to help enrich the dialogue on this blog as we get ready for what will hopefully be an exciting year at this nest. I keep missing the eagle sightings! When I check in the nest is always quiet. It's good to hear that there's been activity. I hope Mother Nature is good to the eagles this year, and good to us also! We need eaglets again! Patrick! It's been a long time since I've visited. I was just watching a video of Lily the Black bear in Minnesota and it reminded me of the wonderful nest in Maine, which got me started on watching wildlife online a few years ago. We've had disappointment at this nest for a couple years, so it's nice to see them working on nestorations. Hopefully we'll see young ones at the nest this year. Thank you so much for all you do to keep the interested public informed. Patrick Keenan - BioDiversity Research Institute, Education and Outreach Coordinator. Patrick's focus is to bring the science of wildlife and BRI's mission to people in Maine and around the world. His background as a research biologist and educator, help him to relate the many trials that wildlife face. Wing Goodale - BioDiversity Research Institute, Research Biologist, Eagle Webcam Program Director, Coastal Birds Program Director. He carries outs diverse fieldwork from conducting bird surveys to testing seabird eggs for mercury to capturing and collecting blood from bald eagles. When not in the field, Goodale prepares scientific papers, conducts GIS analysis, manages Biodiversity’s Web site, and oversees BRI’s live eagle Web camera. Chris DeSorbo - BioDiversity Research Institute, Research Biologist, Raptor Program Director. DeSorbo works on a wide variety of bird-focused research projects, emphasizing intensive research on bald eagles in numerous states. When not in the field, DeSorbo prepares scientific papers and works to expand the scope of the raptor program at BRI.